Col Bennett Park (also known as Ridgewood Road Park) is a major community green space found in the tucked away southern Brisbane suburb of Algester. 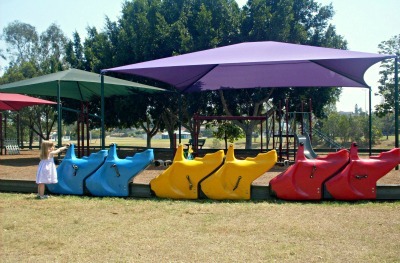 This is the type of park that is suitable for the whole family and caters for a range of different activities. Children can play safely in the two playgrounds, teenagers might prefer to have a game of basketball on the half-courts, while the family dog will enjoy the fenced off-leash area. 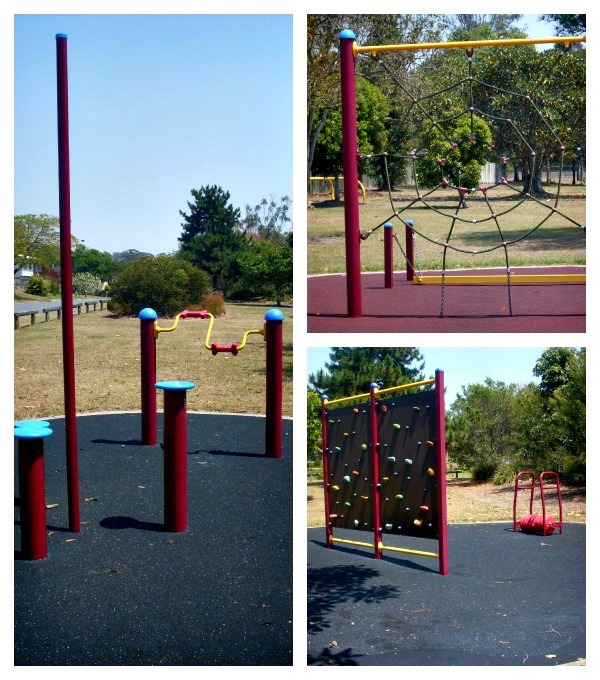 This park has a lot to offer but there are two main reasons why Col Bennett Park is a standout recreational facility - its ability to encourage healthy outdoor physical activity, within a friendly community environment. This park is a must-do for anybody who enjoys keeping fit and healthy in the great outdoors. 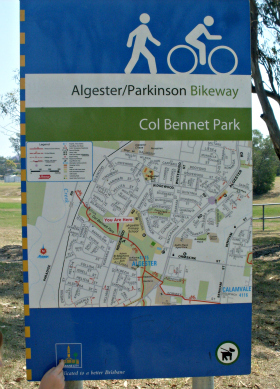 Part of the Algester/Parkinson bikeway runs through the park. This is a shared pedestrian/cyclist network that connects to main roads and other recreational areas across three suburbs. It is common to see people out running, walking and cycling at various times throughout the day, with peak times being around dawn and dusk. There is even a dedicated heart foundation walking group that meets here in the afternoons. For those people who want some variety in their fitness routine without the hassle of expensive gym memberships, there is a range of outdoor fitness equipment available. Various fitness stations are located along the bike path beyond the main playground, including a rock climbing structure, balance beam and low hurdles to jump. The kids really enjoy developing their gross motor skills on the fitness circuit as well. If you're the type of person who prefers organised structured fitness activities then you may be interested in joining one of the local sporting clubs or group fitness session providers based in Col Bennett Park. Council has recently improved the sporting ground facility by adding lights to allow for night use by groups. 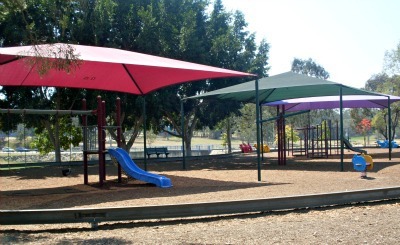 Brisbane city council regularly provides free or low cost activities here through their active parks program. Tai chi, mums and bubs, and kids sports programs are just some of the highlights. The most popular area of the park is the main playground on the corner of Ridgewood Road and Yorrell Street. It's hard not to spot this with its colourful sun shades and surrounding pedal bike circuit. There are three distinct play structures here which are enjoyable and physically challenging for toddlers through to teenagers. The pedal bike circuit is particularly useful for parents of active toddlers who have a tendency to want to explore a little further as this at least slows their little runaways down. Additional shade is provided by the large surrounding trees which also serve as a lovely spot to spread out a picnic rug and lie down for some plane-spotting, as they make their way over to Archerfield airport. Community spirit is obvious in this park. It's nice to get a nod or wave hello from most passers-by on an afternoon's walk. Children who were initially strangers in the playground quickly make good use of the large trees which lend themselves well to a game of hide and seek. Weekend afternoons seem to be especially busy in the off-leash area as people drive from afar to meet up with their canine pals. Large groups gather here most weekends for celebration parties, utilising the shelters and barbeques. Although it sounds quite busy, it is rarely crowded. Part of the charm of this park is its extensive open green space giving the illusion that you are situated far from the main road. Parking is plentiful and the park is easily accessible by bus. The facilities have always been well maintained whenever we have visited. The only downside is the absence of public toilet facilities. 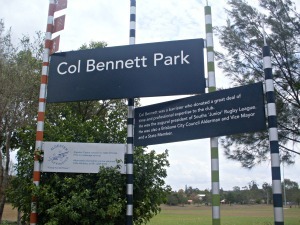 Col Bennett Park is located on the corner of Ridgewood Road, Triantha Street and Yorrell Street, Algester. Brisbane city council bus service 130 is the easiest public transport option with the Ridgewood Heights bus stop next to the park. So if your family needs more 'green time' and less 'screen time', why not pack your lunch and ride your bikes down to this family-friendly recreational park, which not only facilitates but inspires healthy outdoor physical activity. Why? To get the whole family healthy and active in a suburbia green space.